This common complaint discussion is in two parts. This blog post focuses on outdoor moisture sources. The next one considers indoor sources. Wet Materials. Mold grows in the presence of moisture and food—and we make it easier for it as time goes by. It really likes engineered building materials, like drywall and oriented strand board (OSB). To mold, refined wood products are easier to eat. The more we break wood down, the easier it falls apart in the presence of water and moisture vapor. When organic materials get wet, within 24-72 hours, mold will be present. Remember dust is organic too, so anything it rests on will support mold growth! Drainage Through Foundation Walls. This is typically the source of moisture in the basement or crawlspace. Rain water or groundwater weeps or flows through the foundation wall. Then it evaporates, causing high humidity. Some of it condenses. Either way, mold growth is supported. Step one is to move rain water away from the house, such as with gutters, drains, or swales. Controlling groundwater is usually best solved with a good drainage system around the house. Missing or Incorrectly Installed Flashing. 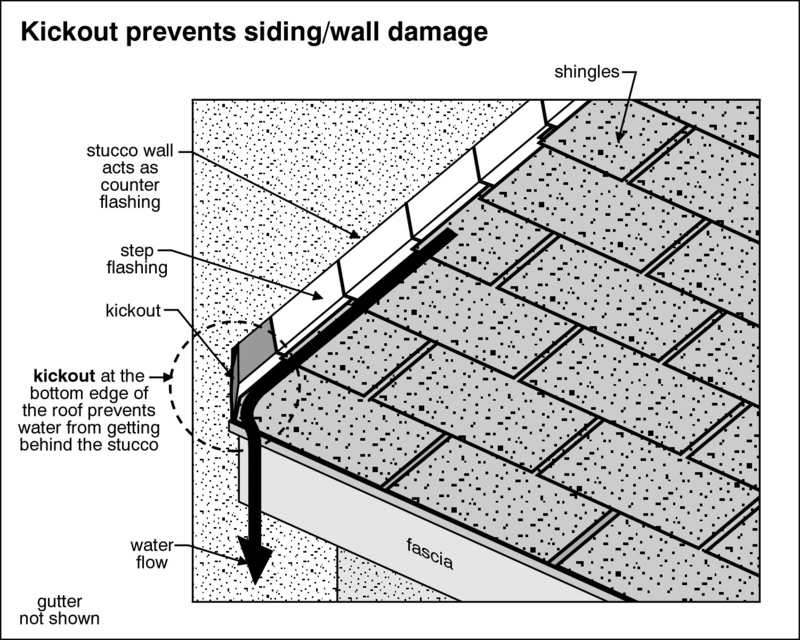 Roof runoff into a wall where roof meets a wall is the most common flashing problem. Why? No one wants to see the tiny piece of metal or plastic turned out at the bottom of the roof. Eight percent of the damage and 50% of the repair cost for fixing stucco homes is the result of this missing kickout flashing. Don’t kid yourself; it happens on all types of house exteriors. The difference? This problem hasn’t been studied for anything but stucco-clad homes. By the time most people recognize this is as a problem, the windows, walls, and floors have rotted below it. By then a mold remediation and a remodeling company needs to get involved. It’s so easy to see it’s missing! Anyone can do it. Water flowing along a wall needs to drain away from it at the bottom of the roof. Similar things happen wherever flashing is missing or incorrectly installed. A roofer or stucco remediator can solve flashing problems. Construction Defects. Think like a raindrop for this one. Water needs to flow down without draining toward or into the house. Flat roofs should slope away from the wall. Shingles must lap over the shingles below. Valleys made by a roof and wall ought to be sloped to drain. Crickets are needed above chimneys too. When water ponds for any reason, there could be trouble. Ponding water drains through cracks—into and down the wall. You’ll probably smell the problem, see water stains, or start to cave through the floor before you know it’s been there a very long time. Moisture out of control is a home performance problem leading to mold and musty odors. Mildew is just 1 of 300K different molds. The whole subject of mold inspecting, mold testing, and mold remediation is found on our mold website. Remember, this the first of two blog posts concerning the common complaint about mold, mildew, or musty odors. This once was focused on outdoor sources. Next time, Part 2 of 2, the indoor sources.